Five-minute hummus with cinnamon-scented chicken. These days, hummus is so ubiquitous that you can pick up a tub at most any store. You can even find snickerdoodle and brownie batter hummus — abominations that are enough to make the mind reel and the taste buds go into perpetual hiding. But for a real treat, try making hummus yourself. 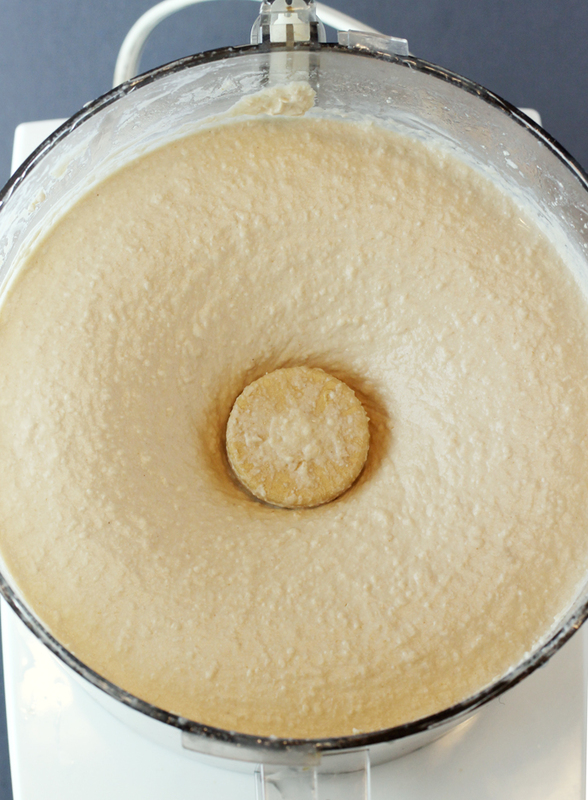 In his first cookbook, “Zahav: A World of Israeli Cooking” (Houghton Mifflin Harcourt), Chef-Owner Michael Solomonov of Philadelphia’s landmark Zahav restaurant, provided a detailed recipe for making hummus from scratch with dried chickpeas that need to be soaked overnight before being cooked until — yes — mushy to get the best consistency. 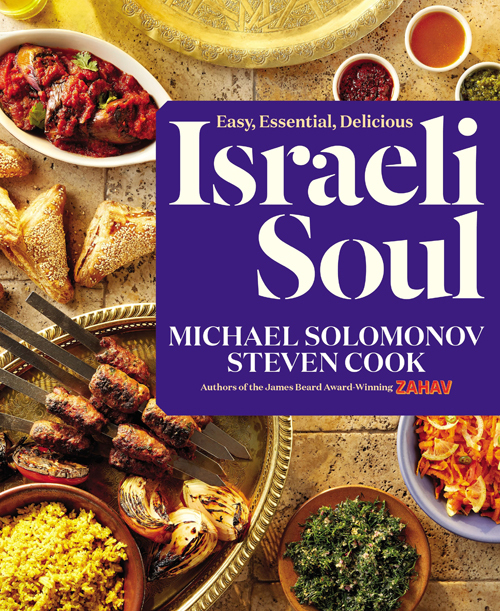 In his second cookbook, Israeli Soul: Easy, Essential, Delicious” (Houghton Mifflin Harcourt), of which I received a review copy, Solomonov and business partner Steven Cook acknowledge that few Israelis make hummus at home because they can get their hands on great versions so easily at supermarkets or hummusiyas. In contrast, the quality of store-bought hummus in the United States can vary greatly, as anyone who has bought a tub can attest. 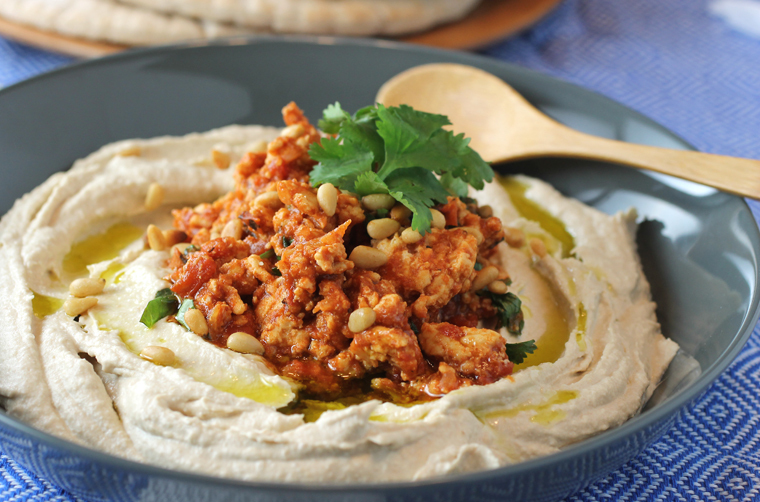 To make it easier for home-cooks here, Solomonov provides a more streamlined hummus recipe in his newest cookbook that makes use of canned chickpeas instead. “5-Minute Hummus” really does come together as fast as it implies. As Solomonov quips, it will take you longer to clean your food processor afterward than it will to actually make this wonderful hummus. 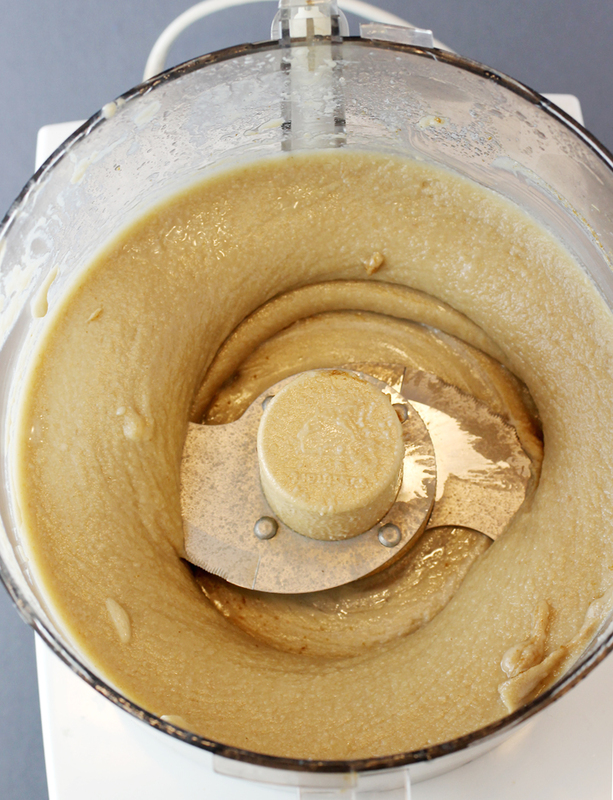 Tahini, lemon juice, salt, cumin and a smidge of garlic get whizzed in the food processor until thick. Ice water is then streamed in with the machine running. 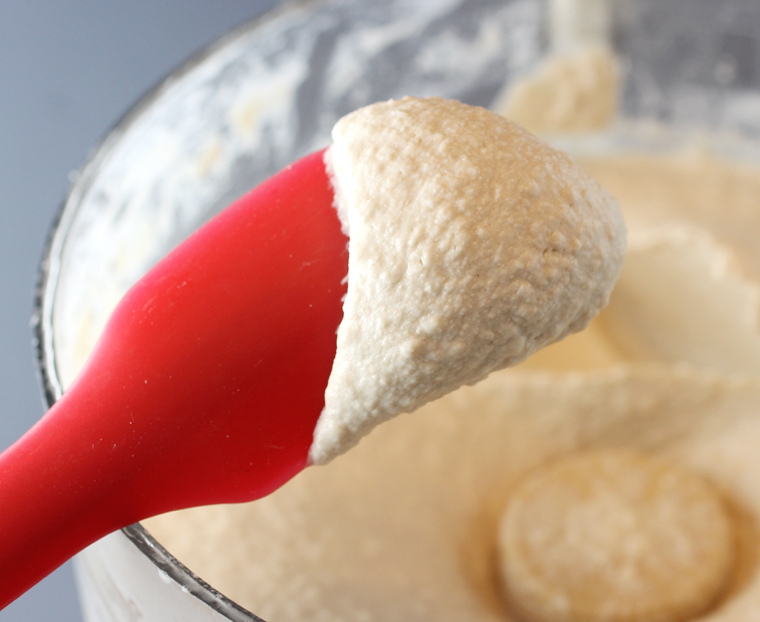 It’s the key ingredient that magically turns the mixture lighter and creamier. Lastly, add the chickpeas and blend until smooth. Whizzing the tehina or tahini with lemon juice and spices. After incorporating the ice water. After blending in the chickpeas. When the recipe ran in the New York Times, many commenters were aghast at the amount of tahini (toasted ground sesame seeds) in the recipe. Yes, it is a lot. 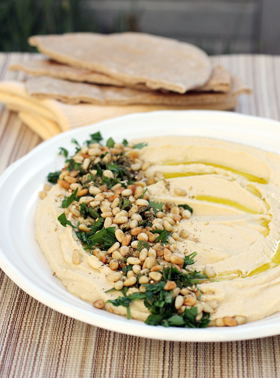 But this is what makes this hummus so flavorful and luxurious. You could cut the tahini way back, but then you’d just have basically a thick chickpea dip, not true hummus with a velvety texture and profoundly nutty taste. After tasting this one, I now realize it has to be this surfeit of tahini that also makes my gold standard for hummus — Oren’s — so devilishly good. 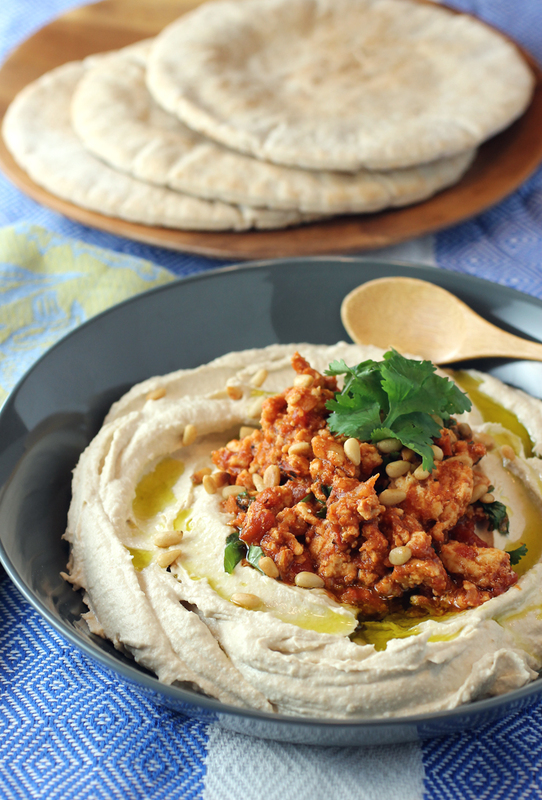 Hummus that’s thick, rich and super creamy. That being said, this hummus is quite rich. The recipe says it makes 4 cups or 4 servings. But I defy even the most ravenous among us to eat an entire cup at one sitting. Instead, I think this serves more like 6 to 8, so I noted that in the recipe. I made his topping of ground chicken that gets sauteed in a pan with tomatoes, grated onion, and a generous amount of cinnamon. 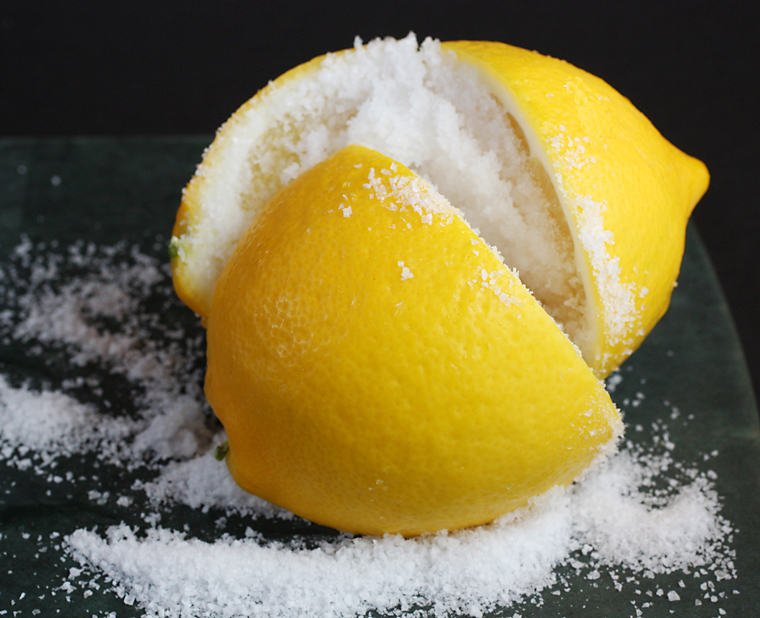 It also gets seasoned with a mixture of preserved lemon, water and honey that gets blitzed in a blender. Garnished with cilantro and pine nuts, the chicken has an aromatic sweet-savory quality almost like that of Moroccan bisteeya. 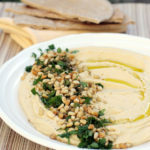 Mound some atop the hummus, and go to town with a basket of warm pita bread. Stream in the ice water, a little at a time, with the motor running. Process just until the mixture is smooth and creamy and lightens to the color of dry sand. Now you have Quick Tehina Sauce, which is perfect on falafel. 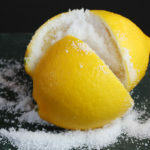 In a blender, puree preserved lemon, honey and water until smooth. Reserve. Heat canola oil in a large skillet and add grated onion. Cook for a minute or two, then add the ground chicken and continue cooking, stirring until chicken is just cooked through. Add 2 tablespoons of the lemon sauce, crushed tomatoes, cinnamon, and ginger. Cook for 10 to 15 minutes more, stirring to prevent burning. Top with chopped fresh cilantro and a handful of toasted pine nuts. 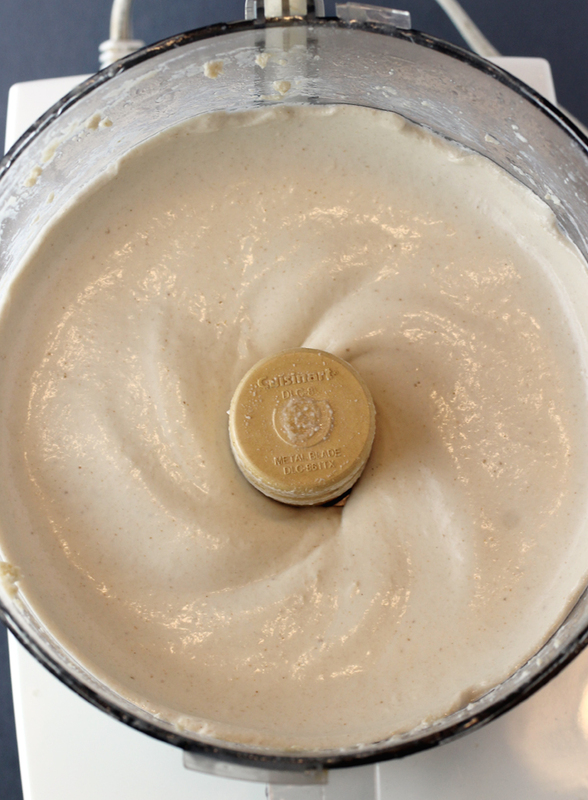 To serve: Spread a generous amount of hummus on the bottom of a shallow bowl. Top with some of the chicken mixture. Enjoy with pita bread. That IS a lot of tahini. But you’re right that it’s the backbone flavor of hummus, so why not use a lot? Looks like a wonderful recipe — thanks. I’m going to take you at your word and try this, Carolyn; you’ve never failed me yet. But…a mere quarter of a clove of garlic? How is it possible to make something, seemingly so tasty, with so little of that magic ingredient? Carroll: I thought the same thing about the 1/4 clove of garlic! I thought, why even bother putting any garlic in? But I understand that a lot of Israelis think American versions of hummus go overboard on the garlic. They prefer a more subtle approach. I can’t say I necessarily knew there was any garlic in the hummus after tasting it. But it definitely is a fabulously smooth, rich and creamy one.